Max Young posted a notice on NW Poker Friday afternoon that Stephen Bokor had passed away. Bokor was an accomplished poker player who grew up in Knappa, Oregon, outside of Astoria, playing online before heading out on the live poker circuit for several years following Black Friday. Bokor ran up a string of cashes before his big win at Pompano Beach in 2013. 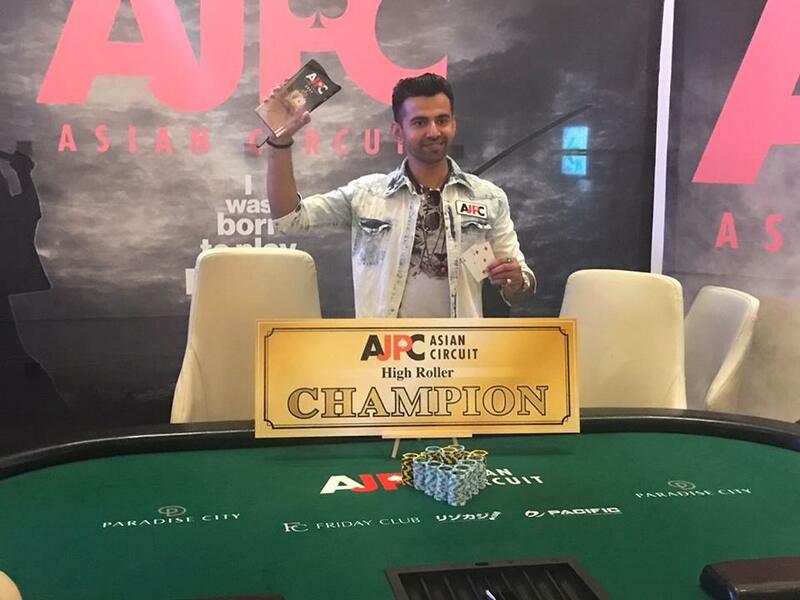 Even before then, he’d caught the eye of poker journalists, and he was profiled in the Global Poker Index’s The Chase shortly after his win. His short career as a live tournament player (his last recorded cash was winning the Fall 2016 Turbo at Wildhorse) currently has him in 18th place on the Oregon All-Time Money List, with more than $400,000 in recorded live tournament winnings. The first Friday in March, Portland Meadows Poker Room will host what owner Brian Sarchi says is the first live tournament poker event with buyins and payouts made in cryptocurrency. Sponsored by Dash (Digital cASH), the promotional tournament is guaranteed to have a 20% overlay; Dash is contributing an extra Dash coin for every Dash coins contributed by players to the prize pool. Dash is providing an on-site cryptoATM for trading in Dash coins. The tournament starts at 7pm on 2 March with 20-minute levels. Buyins are 0.1 Dash coin and payouts will be made in Dash coins. Dash was trading at $672 at 10pm Tuesday, but like a lot of crypto currencies, the price is volatile, and it was over $1,000 as recently as two weeks ago, so another month and who knows? Details on how to get yourself set up with Dash—and how the buyin and payout process will work—should be forthcoming soon. Meanwhile, congrats to Robert Brewer, who won Saturday’s Wild West Poker Series High Roller at Meadows. More on that in a bit. The next Wildhorse Spring Poker Round Up is just a couple months off, the new schedule is out, and there have been some big changes in the routine. 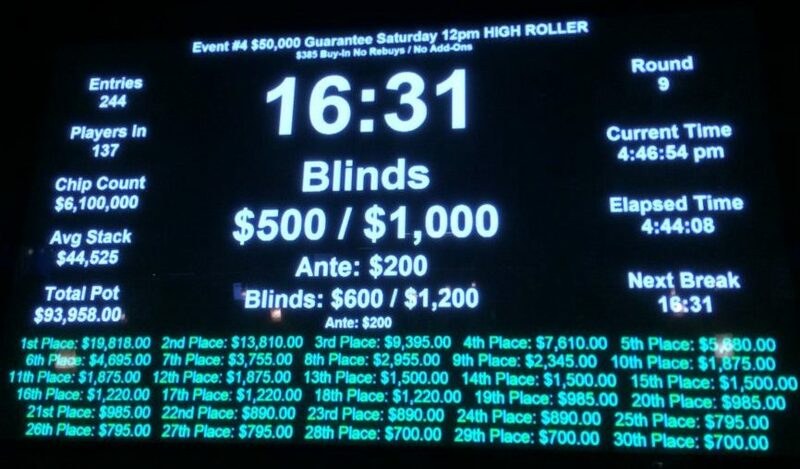 The High Roller tournament has been moved to the first weekend of the series, out of the mid-week doldrums. HORSE is back! It has a smaller buyin and it’s running on the first Sunday—at 7pm—which doesn’t seem to be very high expectations, but it is on the schedule, and it leads directly into Omaha Hi-Low on Monday and Big O on Tuesday, so mixed-game players can make the most of their time out east. That also means the end of the week after Wednesday’s Seniors tournament is straight Hold’em leading into the Main Event on Saturday. I can get behind that. The final table of the Wild West High Roller was played out on the RFID table used by The Poker Guys to shoot their Poker Time show, and they’re also running Sit & Gos this week that should all be showing up on YouTube soon. Idaho’s Dylan Linde played the Lucky Hearts Poker Open High Roller last week and took 5th place out of 75 players putting up $25.5K each. 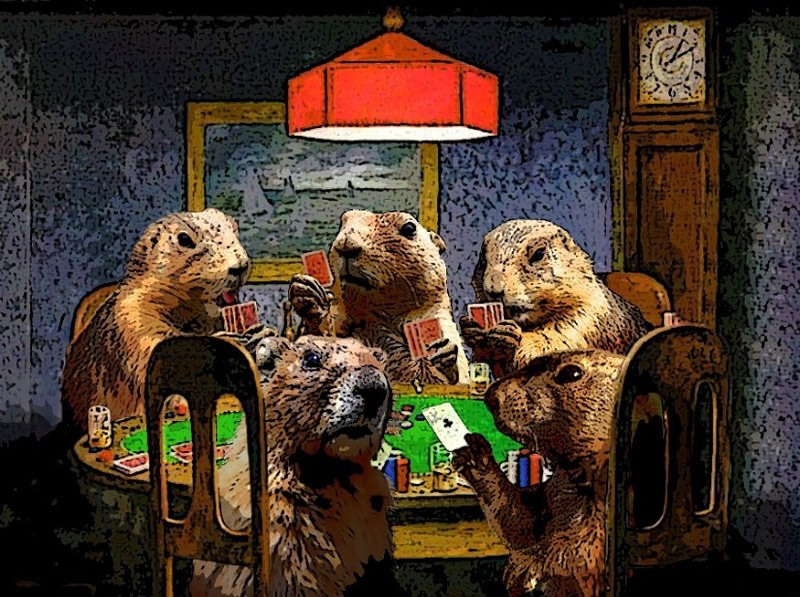 Friday is the First Friday of February (and Groundhog Day), so it’s time for a $20K at Final Table. This is also Super Bowl weekend, and Portland Meadows will be closed for the day (according to their web site). Final Table will be open, though you may want to check about guarantees on Sunday. I had a ticket to a Quarterfinal single-table-satellite to this weekend’s Ignition $250K GTD (the winner of the 6-Max table got a seat into the direct satellite). We started with 75bb, a player got knocked out on the first hand, I was cut down to 7bb on hand 6 when I ran into aces, I managed to battle back to 65bb and the chip lead with three players by hand 35, but I couldn’t close out the heads-up. I played a bounty tournament and just got a couple of bounties, played my first live tournament in a couple of weeks at Portland Meadows on Friday night and just frittered my stack away. I didn’t see a pair over sizes in three hours—one of the guys at the other end of the table got aces on consecutive hands (see my PokerNews article “In and Out of the Luckbox”, or just play with the Starting Hand Distribution Simulator). Didn’t even make the break. 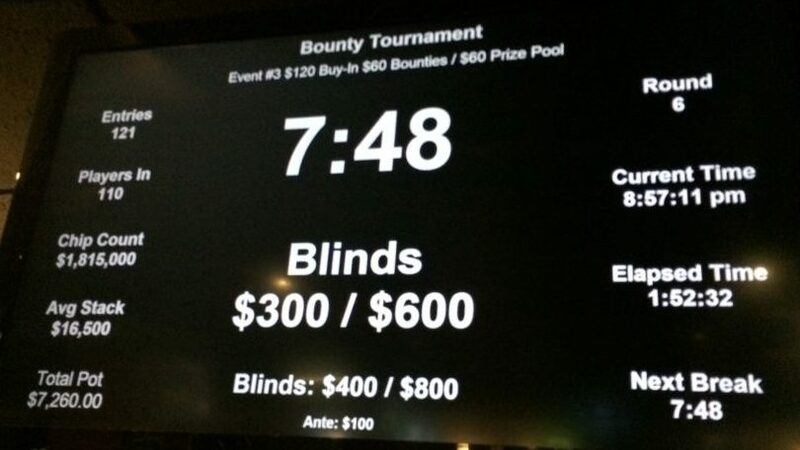 I had to work and missed the 6-Max at noon, but it had just gotten into the money as the bounty tournament was starting up, with more than four times the guarantee in the prize pool. I hadn’t though the Warp Speed to the Final Table tournament would have been very exciting, but the crew made a show of the all-in first hands on the RFID table, and people seemed to be having fun. Saturday, I lasted about five hours in the High Roller, doing what I thought was reasonably well until my table broke and I was moved to Table 1 which housed Brandon Cantu and the eventual champ (pictured above) Robert Brewer (btw, you can read my 2015 interview with Robert at PokerNews). I missed the Survivor tournament on Sunday night because of a family thing, and that’s the end of a very unproductive poker week. 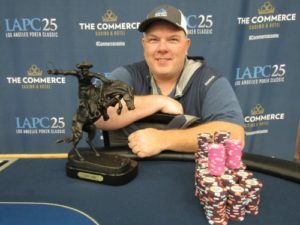 Los Angeles Poker Classic 25 at Commerce Casino finishes out its first month of events with HORSE tomorrow, Triple Triple Draw on Friday, and NL HORSE on Saturday. Early next week is Stud Hi-Low, Omaha mix (Big O, PLO8, and O8), and NL O8 on Tuesday, then a $300K GTD multi-entry tournament at the end of next week. At Venetian Deepstack Extravaganza the Mid-States Poker Tour to present a $500K GTD tournament with $1,100 buyin Thursday and Friday. Saturday is a $100K GTD Bounty ($1,100 buyin). Next week is a $400 tournament with $100K GTD and on the weekend if a n 8-Max $800 tournament with $250K GTD. The annual Winter Super Stack is at Calgary’s Deerfoot Inn today. Thursday is the first of three C$550 Mega Stack entry days, and there’s a C$330 PLO Bounty on Saturday. No guarantees, but the opening event last year (same buyin) had a prize pool of $128K in US dollars, with the $1,500 buyin Main Event (starting 9 February) reaching US$250K. Alaska Airlines has seasonal direct flights from Portland to MIlwaukie, Wisconsin, but winter is apparently not the season. I’m going to throw WSOP Circuit Wisconsin into the mix anyway, since you can get there direct from Seattle and prices are reasonable (less than $500 RT). The Main Event for this stop has a $750K guarantee. Starts 1 February. 1 February is also the start of the US Poker Open at Aria in Las Vegas. The events have buyins of $10K to $50K, but there are supposedly side events in the mere three figures, according to Poker Atlas. Ontario Poker Room has a $115 buyin Deepstack on Saturday if you’re on the east side of Oregon. Portland poker writer Zach Elwood (Reading Poker Tells, Verbal Poker Tells, and Exploiting Poker Tells) was interviewed on the penultimate episode of Season 4 of The Chip Race podcast, by Irish pros David Lappin and Dara O’Kearney. Zach’s segment starts about 15 minutes in and lasts for 20 minutes, it’s worth checking it out. The same episode features the second half of a Phil Hellmuth interview that has nothing to do with the Northwest but is a prime example of cluelessness, in which he expounds at length on how sad it is that the haters hate Chris Ferguson, all for no reason he can see. Fortunately, poker nit personality Carlos Welch also makes an appearance ( as he has on a variety of other podcasts over the past few years. He was on the verge of moving to Portland a couple of years ago, and it appears he may still be on the verge. He got his teacher certification last summer. (I wrote about playing with Carlos in a Thousandaire Maker a couple months back). The plan is May when the weather turns, but possibly the last part of April as well if I've busted my roll by then. I'll sub during the day and teach gas pumping classes in the evenings. Last but not least in the personality parade is one of the new faces on the latest session of Poker Time, Jeremy “Worm” Harkin. I owe Jeremy a debt of gratitude for providing me a place to stay (for money, natch, but at a decent rate) when I was in Las Vegas for the 2016 WSOP. And I agree with him that they need to run some PLO on Poker Time. Chris Hinchcliffe‘s player profile for winning the opening $1M GTD opener at the Los Angeles Poker Classic says Northern California, but Hendon Mob says Olympia. There was a 3-way ICM chop; Hinchcliffe had nearly two-thirds of the chips in play. It was his fourth final table of 2018—so far he’s had three figure, four-figure, five-figure, and six-figure cashes (not in that order). Ron Brown of Spirit Lake, Idaho bested a field of 160 at the WSOPC Event #4 at Thunder Valley before turning around and beating 128 in Event #8 then taking 12th in Event #10. The three cashes more than double his tracked lifetime tournament earnings. 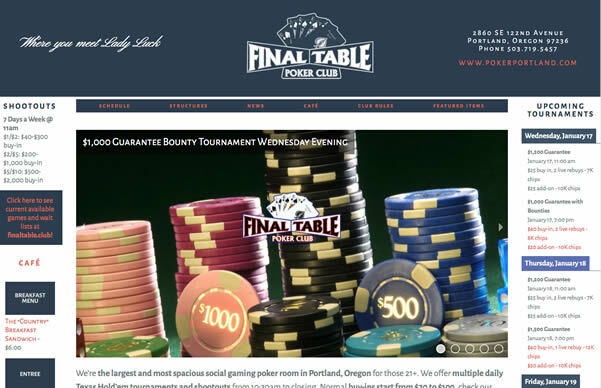 It’s time for the Wild West Poker Tour at Portland Meadows this weekend. Seven events including a 6-Max, Bounty, High Roller, and a Survivor. I’m looking forward to all of them, but the 6-Max is during a work day…might be a lot of sick poker players that day. A down week for me in more than one way since the last Planner. I sat out my usual Friday evening game at Final Table because of some other obligations, and had a mid-afternoon event on Saturday that prevented me from making it up with the weekly $10K at Portland Meadows or the Main Event at Tulalip. So it was a strictly online for me. Busted three Thousandaire Maker tournaments, dumped four buyins in PLO and PLO8, and played thirteen other NLHE, PLO, and PLO8 tournaments, with only one cash, and that wasn’t particularly big, even though it was 6th in a field of 177. I was double-tabling on Friday and Saturday nights, holding first and second place in two of the tournaments for a while. Then I wasn’t. I missed a few tournaments this month when I was rounding up stuff for the calendar. Colorado, Alberta, Callifornia…I’ll try to get back on track. The Wynn Signature Weekend starts today. The highlight is the $250K GTD $600 buyin tournament (3 entry days). There’s also a $300 buyin Survivor tournament on Sunday with a $2.5K payout. Ocean’s Eleven San Diego Classic starts tomorrow with the first of three entry days for the $150K GTD ($250 buyin). There may still be a seat into the Stones Gambling Hall $1,100 single-table Sit & Go; three players make the money. Register you seat now at the Saloon cage for the @StonesLivePoker $1,100 buy in Single Table Sit & Go! The $300 Muckleshoot Deepstack is Sunday at noon in Auburn. Monday is the beginning of the first Venetian Deepstack Extravaganza of 2018. Opening day has a $12K GTD PLO/PLO8 tournament. The Venetian teams up with the Mid-States Poker Tour to present a $500K GTD tournament with $1,100 buyin next Thursday and Friday. The annual Winter Super Stack is at Calgary’s Deerfoot Inn next SWednesday. Thursday is the first of three C$550 Mega Stack entry days, and there’s a C$330 PLO Bounty on Saturday. No guarantees, but the opening event last year (same buyin) had a prize pool of $128K in US dollars, with the $1,500 buyin Main Event (starting 9 February) reaching US$250K. Ali Imsirovic has been mentioned here a couple of times in the past few months—the first was at the end of November when a 4th place finish in the WSOPC Planet Hollywood Main Event brought him to my attention—but as I’m an idiot, I had no idea of what he was doing, despite the fact that he’s based in Vancouver, Washington. According to a comment on NW Poker by Preston Jarneski, Imsirovic has “been crushing ACR [America’s][Card][Room] for a few years now.” Imsirovic’s Hendon Mob profile shows a string of three- and four-figure cashes going back to the 2015 Punta Cana Poker Classic, cashes in the Czech Republic, Austria, with a couple of bigger numbers posted in Las Vegas and Florida last year. Then, in November, Imsirovic kicked into 4th gear in Vegas with the WSOPC main Event, a 4th place cash in a small $10K at Bellagio’s WPT Five Diamond, and 4th at the Venetian in the $3,500 December Extravaganza Main Event. Then he went to the Bahamas for the PokerStars Caribbean Adventure. 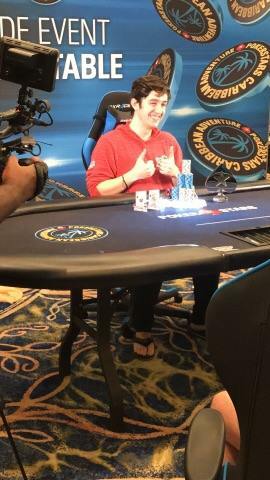 I got a message from the fantastic Mr. Sam Cosby on Sunday afternoon that “Portland resident Almedin Imsirovic just won 10k hyper turbo spade at PCA.” Imsirovic inserted himself into another $10K buyin (just a couple of days after min-cashing in a $3.3K event) to best a field of 55 in a 15-minute blind structure, at a final table that included Sam Greenwood, Stephan Schillhabel, Mustapha Kanit, and Benjamin Pollak, beating out WSOP Main Event Champion Ryan Riess heads-up for the $160,050 prize. Not bad for seven hours work. In the past eight weeks he’s climbed from 202nd to 40th on the Washington all-time money list at Hendon Mob. You can see a lot more of Imsirovic (or at least hear him) in strategy videos he’s done over the past couple of years for Gripsed Poker Training including analysis of a 2014 win in a $200K guarantee on Bovada. There’s a benefit poker tournament in Estacada on 27 January for the Estacada Community Foundation. Entry is a $40 donation and prizes include a 55″ flat screen TV, a live-feed video drone and a number of other fine items. The tournament is limited to 100 players (entry includes appetizers, beer, and wine). The event will include blackjack tables, and registration starts at 5pm at the Estacada Community Center (200 SW Club House Road), with the game starting at 6pm. 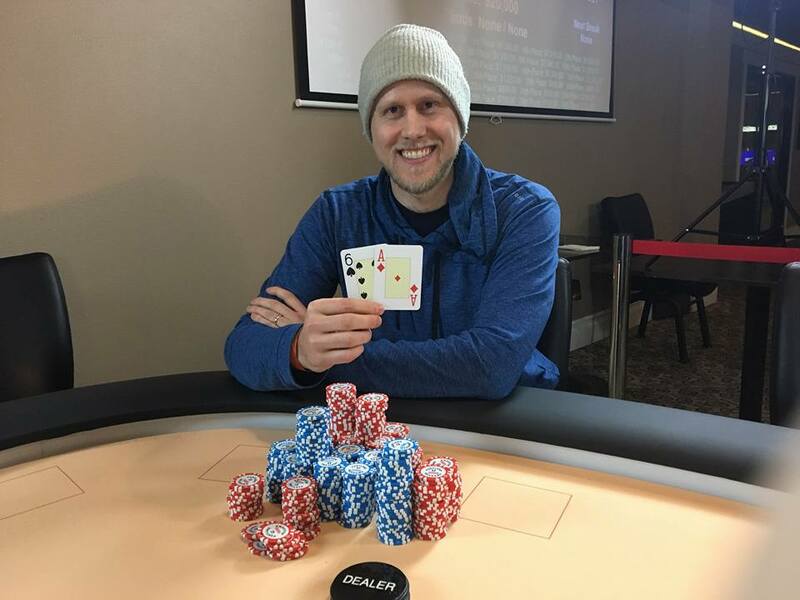 Ali Imsirovic pretty much walked away with the leaderboard this week, but Max Young was part of the Northwest gang down at WSOPC Choctaw, where he racked up another Ring (his third) for Event #8 NLHE 6-Max. That’s after winning a side event and making the final table of Event #7, but before he got into the top 5% of the Main Event. Anyone else? David Mallet—who won the Seniors event at Wildhorse in November—came in 2nd/509 in Venetian New Year’s Extravaganza Event #18 in what looks like a three-way deal. Kevin MacPhee and Darren Rabinowitz both min-cashed in the PCA Main Event. 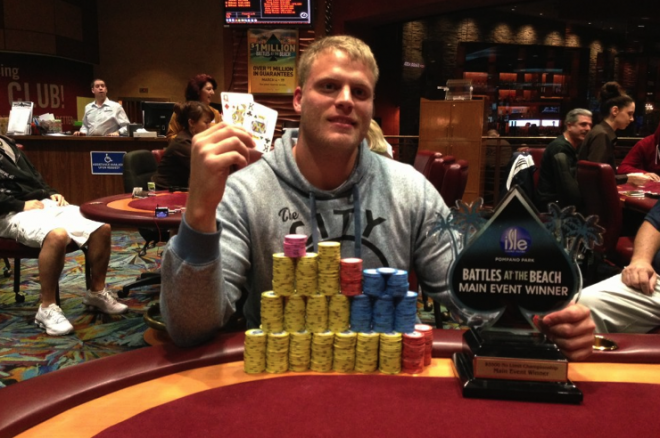 And Baptiste Chavaillaz made the final table of Event #9 at Choctaw. 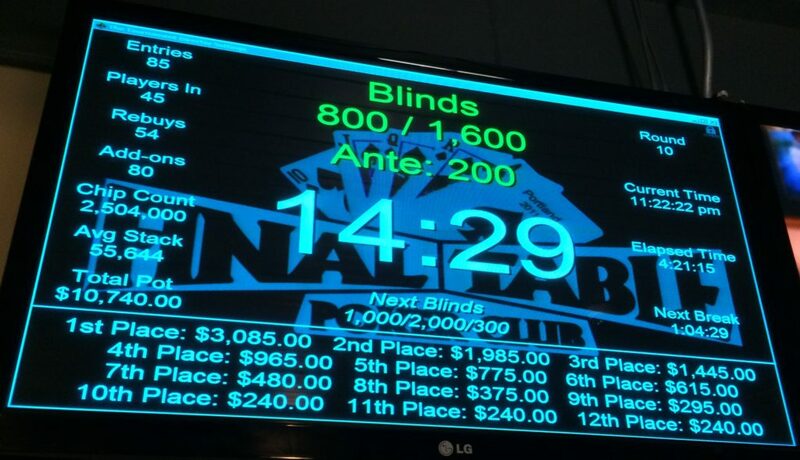 This week’s big events are the Friday night $10K at Final Table and the Saturday noon $10K at Portland Meadows. It’s your last chances to pick up some big money before next weekend’s Wild West Poker Tour at Meadows. As mentioned above, The Game is trying to get 2/5 PLO shootouts running Thursday nights. They also have After Hours Thursday, Friday, and Saturday, from closing to 8am. The Tulalip Poker Pow Wow $100K GTD Main Event has its first flight tomorrow, with another on Friday and the last on Saturday, $520 gets you in and the dealer addon. Los Angeles Poker Classic 25 at Commerce Casino has a $250K GTD tournament this weekend with just a $175 buyin. Flights through Saturday at 5pm. Thunder Valley’s World Series of Poker Circuit, has a $500K GTD Main Event ($1,675 buyin) with entries on Friday and Saturday. The Venetian January Weekend Extravaganza has flights for a $250 buyin $250K GTD tournament through Saturday. The $250 Muckleshoot Big Bounty is Sunday at noon in Auburn. Next Sunday Sunday is a Deepstack with a $300 buyin. Saturday is the Ontario Poker Room Team Tournament, with a $125K buyin and $100 rebuy. The Wynn Signature Weekend is coming upa week from today. The highlight is the $250K GTD $600 buyin tournament (3 entry days). There’s also a $300 buyin Survivor tournament on 28 January, with a $2.5K payout. It was four years ago this month that I wrote In the Money, a little screed on long-term profitability for poker tournament players, which led to me writing for PokerNews for a couple of years, as well as my one foray into live reporting at the WSOP. It sparked a small amount of controversy, its own thread in the Two Plus Two News, Views, & Gossip forum, and a couple of podcast interviews. There was a lot of pushback from poker pros, and a few high-fives from cash game specialists like Limon (who is once again been hounded off of Twitter, sadly). But last week, Daniel Negreanu put up a year-end post with a collation of his results from the past five years, casually dropping that he had losing years for 2016 and 2017. In fact, it it hadn’t been for the enormous Big One for One Drop payout for 2nd place in 2014 ($8.3M), only two of the five years would have been profitable, making him an average of about $89K profit per year on more than $2M in annual buyins. And that’s Daniel Negreanu we’re talking about, not mildly-talented tournament grinder. I’ve put a lot of work into the #PNWPokerCalendar over the past few years. Did you know that you can sort the events by region? There are buttons at the top of the calendar that will select just the series and events for a speciific area: Southern California, Nevada, Portland, etc. You can also view events for just a single week. And over the past few months, I’ve been adding in entry information for specific events in brackets, just in case you haven’t already figured that out: [125e100b] means entry is $125 and rebuy is $100. 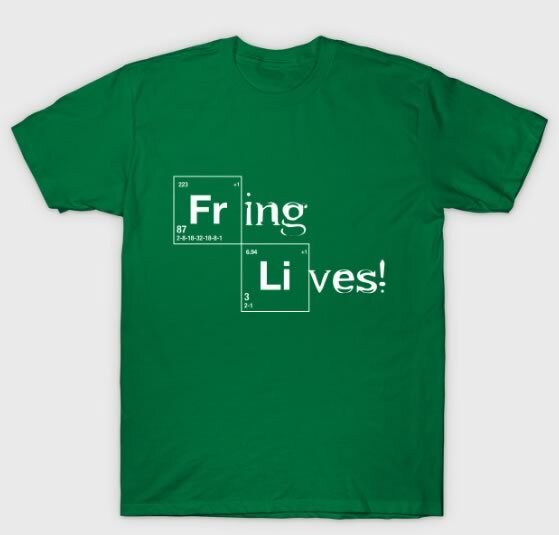 An a is addon, natch. Where possible, I include any fees or dealer addons in the entry value. Oh, and there’s an Expedia flight search link (you can also find hotels and cars) at the bottom of the page if you see something you like. 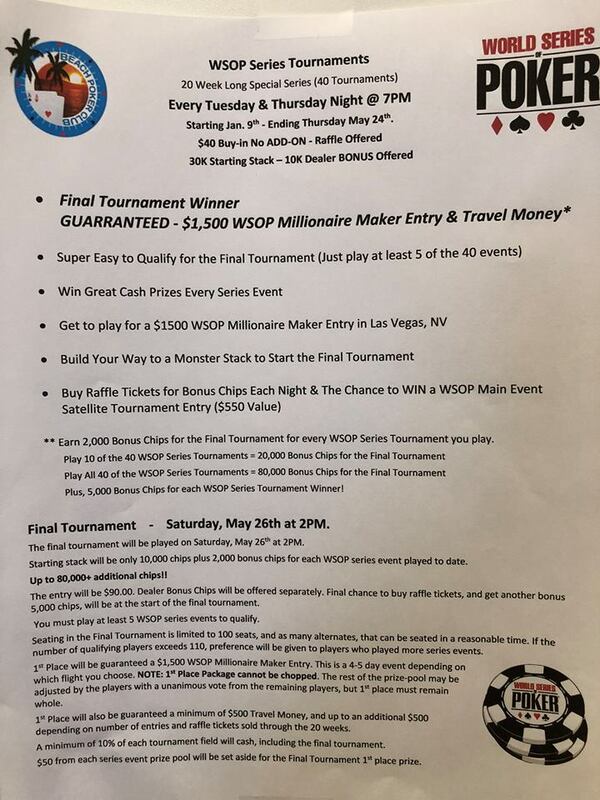 If you’re in Eugene on Tuesday or Thursday nights, the Beach Poker Club is running qualifying tournaments to their 26 May Final Tournament, a 100-seat event where the winner gets a seat and travel money to the WSOP Millionaire Maker. 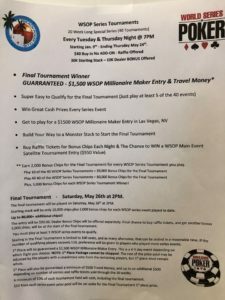 Playing five of the semi-weekly tournaments gets you a seat, and the more tournaments you play, the more chips you get for the final tournament, plus there’s a Main Event Satellite entry up for raffle. 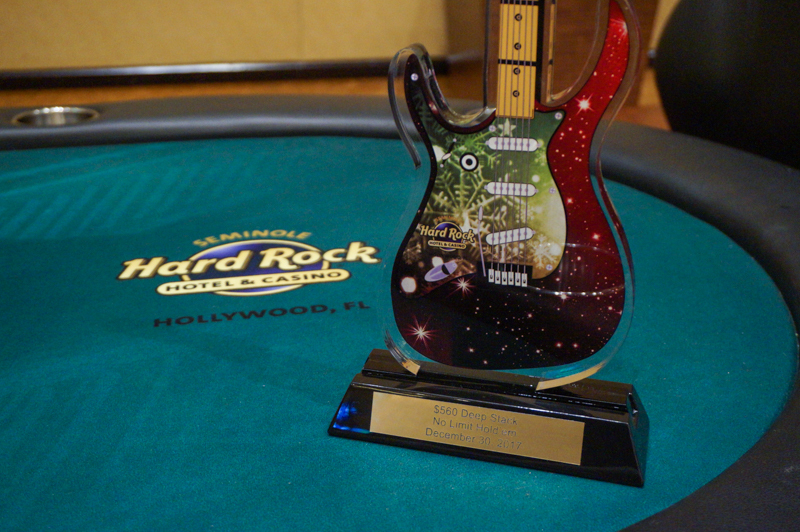 One big result out of the other end of the continental US: Beaverton’s Nathaniel Anderson cut a deal for second place in the 197-entry Seminole Hard Rock Fun In the Sun Main Event just before the New Year. He was out-chipped 2 to 1, and he didn’t get the nifty guitar trophy, but he did get nearly twice the 3rd-place money. I’ve been picking my poker action back up since the lull of the holidays. I played two Thousandaire Makers mid-week (busting within ten minutes of the second after entering more than an hour into the tournament), then logged into a $15 Jackpot Sit & Go, picked up another 5x ($75) payout but couldn’t close it out. Played a few sessions of PLO and PLO8 online, then it was the Final Table First Friday $20K Guarantee. I was out before the break and managed to make a faux-pas. Saturday, though, was my first Thousandaire Maker cash of the year. Even losing a couple buyins in PLO the next day it was still a profitable week. 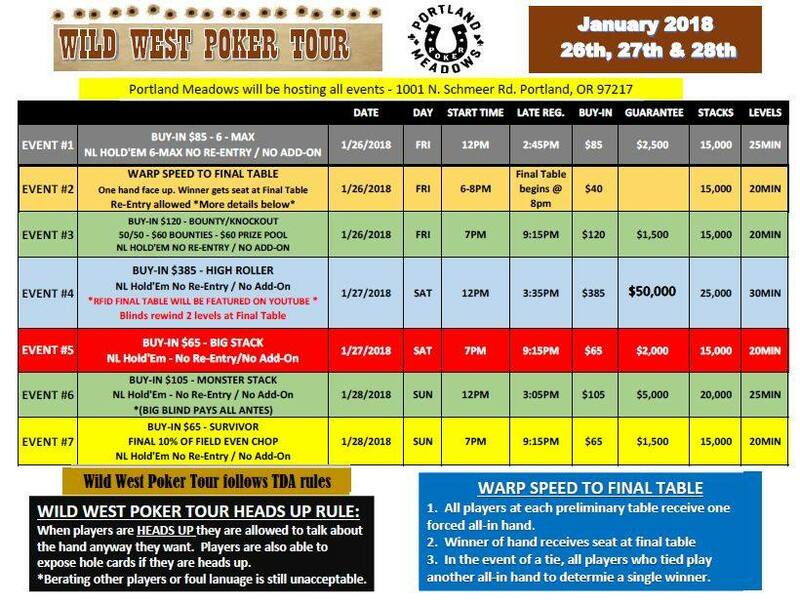 The schedule for the Wild West Poker Tour showed up on NW Poker the afternoon I posted last week’s Planner, so I didn’t get a chance to say anything about it, but I guess I’m going to have to take a day off work if I want to play the 6-Max at noon on Friday, 26 january. I am eager to be either on the YouTubed High Roller final table or commentating on it, but I’m pretty sure neither is happening. And the Sunday night Survivor; it should say right up front for clarity that 10% of the field is going to get $650. But I’m liking it. The Tulalip Poker Pow Wow is under way. There is a satellite tonight and next Wednesday, with the 4-Game Mix on Thursday (1pm) and two entry days to the $50K GTD weekend event on Friday (1pm) and Saturday (11am). Monday is the 2-Game Mix, Seniors on Tuesday, then the $100K Main Event has three starting days on 18 January. Heartland Poker Tour is at Ameristar East Chicago with the Main Event ($1650 entry) starting Thursday. Los Angeles Poker Classic 25 at Commerce Casino in Los Angeles has their $1M GTD Kickoff tournament this weekend, with a $350 buyin and entry flights through Sunday morning. Friday is the beginning of Thunder Valley’s World Series of Poker Circuit, the closest approach the WSOPC makes to Portland. The $250 Muckleshoot Monthly Special is Sunday at noon in Auburn. The next Sunday (21 January) is the Big Bounty, and the last Sunday is a Deepstack. 20 January is the Ontario Poker Room Team Tournament, with a $125K buyin and $100 rebuy. The Wynn Signature Weekend is coming up 24 January. The highlight is the $250K GTD $600 buyin tournament (3 entry days). There’s also a $300 buyin Survivor tournament on 28 January, with a $2.5K payout.